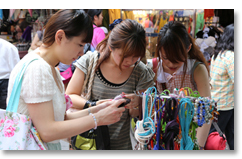 Seoul's markets will reveal that today's "Made in Korea" craze did not take place overnight. bit of legwork, you can find a wide range of high-quality products at prices much lower than those found at department stores. 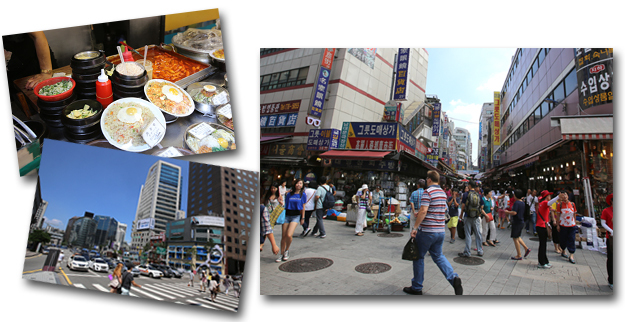 developed into what it is today-Seoul's most representative market. dissipate like goblins would in Korean folklore when the authorities appeared close by. shopping center, selling not only sundries but also specialized products like cameras. 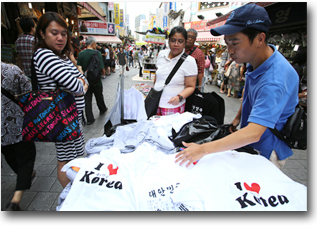 To many Koreans, "Myeong-dong" is Seoul's Main Street. Myeong-dong takes its name from the old "Myeongnyebang" district of Joseon Dynasty-era Seoul, an area that included the villages on the lower slopes of Mt. Namsan and what is today Myeong-dong Cathedral. Myeong-dong developed into Seoul's commercial district during the Japanese colonial era. 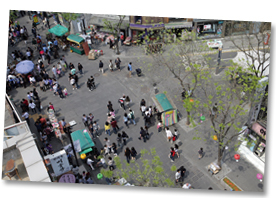 The Japanese colonialists who settled in the Namsan area developed the Chungmu-ro and Myeong-dong districts into commercial areas, with Myeong-dong transformed into a neighborhood of shops. After Korea's liberation from Japanese colonial rule in 1945, Korea's young artists and Seoul's finer dressed inhabitants flocked to Myeong-dong. The neighborhood became a center of culture and art after the Korean War as bars and dabang-old-fashioned tea and coffee houses frequented by Korea's 20th century intellectuals and artists-moved in. One dabang in particular, Dolche, was especially popular with the post-war period's roving artists, who frequented the shop for its coffee, conversation and the classical music records it played. Growing famous for its live music cafes, high-end dress and suit shops, large department stores and imposing bank buildings, Myeong-dong became both a central axis of Korea's developing consumer culture and one of Seoul's most popular entertainment districts. In the 1970s, its star waned a bit as major shops began relocating to the newly developeddistricts of Gangnam and Yeouido. Myeong-dong's has roared back to life, however. Thanks to the Korean Wave boom, it is now packed with international tourists searching for Korean-made cosmetics and fashion products. 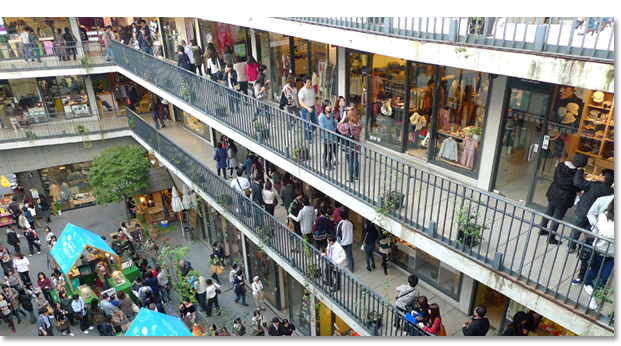 Myeong-dong's shops and even its outdoor stalls are full of newly released products of exceptional design. It wouldn't be an exaggeration to say Myeong-dong is the place to go to find fashion's leading edge. The storefront posters featuring the faces of popular Korean Wave stars and dynamic street performances lend Myeong-dong an atmosphere of energy. Two must-see places are the historic Myeongdong Theater, a colonial-era movie theater that later served for a time as the National Theater of Korea, and the hilltop Myeong-dong Cathedral. A beautiful Gothic cathedral built by French missionaries at the end of the 19th century, Myeong-dong Cathedral is not only a symbol of Korea's Roman Catholic community, but it is also considered hallowed ground of Korea's democratization movement of the 1970s and 1980s. Have your picture taken in front of the cathedral-you'll get Namsan's Namsan Seoul Tower in the background, too. To some up, Myeong-dong is a global tapestry woven by Seoul's fashionistas and the international tourists searching for the Korean Wave. 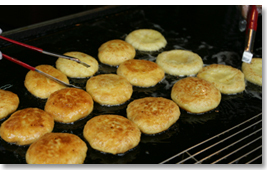 It's also a culinary hotspot, too, with well-known eateries like gomtang (oxtail soup) specialist Hadonggwan and Taiwanese dumpling shop Din Tai Fung. The Ponte Vecchio on Florence's Arno River is famous for its many jewelers and jewelry shops. Along Seoul's central Jongno Street you'll find a row of jewelers who account for 80% of Korea's jewelry trade. According to an old Korean tale, Princess Gongju sold her jewelry to make ends meet after she married the unschooled and unaccomplished Ondal. In the old days, jewelry was worn only by royalty. In more modern times, after jewelry had grown more common, people sometimes used their jewels as currency in emergencies such as war. Perhaps it's because of this that the custom of exchanging wedding rings has lasted so long. Jongno Jewelry Arcade actually began in Myeong-dong. The jewelry manufacturing groups and retail associations that were in Myeong-dong moved to Jongno and Yeji-dong in the early 1990s. Afterwards, retailers moved in along Jongno 3-ga. 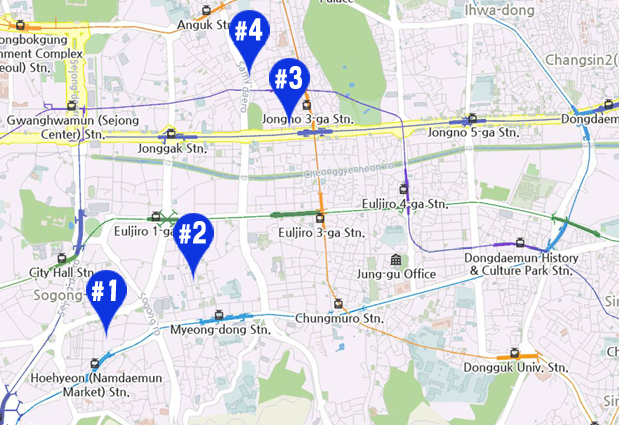 Many jewelers had already moved into the Yeji-dong and Jongno 4-ga from the 1960s. Many elderly Seoul residents still recall with fondness the merchants who used to sell used foreign-made watches from atop old boxes at Jongno 4-ga.
Usually made by hand back in the days when the shops were in Myeong-dong, jewelry began to be mass-produced with the adoption of casting equipment from the mid-1980s. It was at this time that the jewelry shops really began to take off. 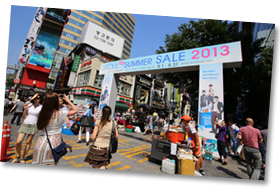 Today there are about 1,000 jewelry retailers along Jongno, joined by about 2,000 wholesalers and 1,000 manufacturers. The shops along the main road are almost all retailers, while the wholesalers and manufacturers can be found in the alleys. The jewelry arcade that were located in Yeji-dong's Seun Arcade moved almost entirely to Seun Square or Hyosung Jewelry City after the Seun Arcade was redeveloped. Most of the jewelry shops concentrated around Jongno 3-ga are connected to one another, and the fierce competition drives down prices. Most of the shops offer almost the exact same items so price wars are frequent. 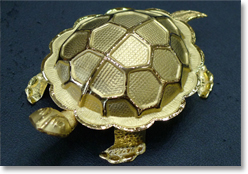 Along with a wide range of accessory jewelry, we can find a lot of distinctly Korean gifts here, too: gold pigs given as presents for first birthdays, gold tortoises that bring domestic happiness, gold ducks that bring marital harmony and more. The area around Jongno 3-ga gets a steady number of young couples preparing for weddings and tourists. The merchandise here is not only much cheaper than what you'd pay at a department store or elsewhere, but the variety's better, too. 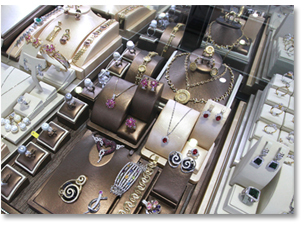 You can also find precious stones, semi-precious stones and even used foreign watches. Despite the low prices, the shops frequently have a reputation for quality, and you can get certificates of product quality and even repair services. Korean jewelry makers have won gold at the WorldSkills Competition for 14 straight years. It won't be long before Korean jewelry makers will be producing products that surpass those of Italy's globally renowned jewelers. Full of galleries, calligraphy supply shops, frame shops and antique shops, Insa-dong Road stretches for about a kilometers from Insa-dong northward past Gwanhun-dong to the Anguk-dong Intersection. The outdoor performance venue Naminsa Madang Stage in the south and Buginsa Madang Plaza-recognized by the big statue of a calligraphy brush-in the north mark the two ends of the road. Both make excellent points of departure. Before beginning your exploration, it's a good idea to stop by Insa-dong Information Center. You can pick up good maps and guides of the area from the center. In the days of the Joseon Dynasty, Insa-dong-wedged in between Bukchon and Jongno-was inhabited largely by the middle class. Even then the neighborhood was known as the heart of the royal capital's artistic scene. From the 1930s, however, merchants selling old books and old works of art began to congregate in Insa-dong, and the neighborhood came to be known as the place to pick up antiques. In the 1970s, commercial galleries began to move in, and Insa-dong's main drag became a street of arts and culture. In the 1980s, more galleries, antique furniture stores and folk craft shops moved in, and Insa-dong truly became Seoul's most representative zone of Korean traditional culture. 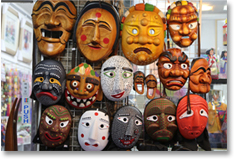 Insa-dong Road has hundreds of galleries, calligraphy supply shops, antique art shops, traditional craft shops, frame stores, Korean restaurants and traditional tea shops. The paper hangers here use traditional techniques to hang Eastern paintings, Western paintings and calligraphy. Exploring the street's museums, antique shops and ceramics galleries is a good way to discover the excellence of Korean culture. Checking out the rows of Korean traditional crafts or antiques on display at each shop is almost as good as visiting an art or history museum. As you slowly make your away around the cross-shaped main streets of Insa-dong and the many narrow alleys that branch off from them, you'll be taken by the charm of the neighborhood's remaining hanok, or Korean traditional homes. In the heart of Insa-dong is the Kyungin Museum of Art, which maintains the beauty of Korean traditional architecture, and the unique shopping experience that is Ssamzie-gil, a popular tourist destination. The helix-shaped Ssamzie-gil is an exquisitely designed gallery space from its first floor to its 4th floor roof garden. Here you'll find plenty of products that maintain age old traditions even while keeping up with the latest fashion trends. Insa-dong Street has quite a few sites of historical and cultural interest, too, including the former location of Joseon Dynasty philosopher's Yi Yi's home, the site where the Korean Declaration of Independence was read on March 1, 1919, the site where late Joseon Dynasty statesman and patriot Min Yeong-hwan committed suicide to protest Japanese aggression against Korea and the Cheondogyo Central Temple, a beautiful early 20th century building that's the mother temple of Korea's indigenous Cheondogyo religion. 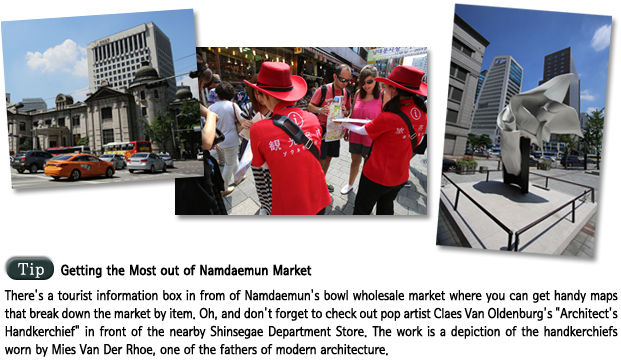 Taking in all these sites gives you a closer connection to Insa-dong and its culture. Stop by the Insa-dong Information Center (T. +82-2-737-7890) or the tourist information booths at the north end (T. +82-2-734-02222) or south end (T. +82-2-737-7885) of Insa-dong Road to pick up a map-it'll make your tour of Insa-dong much more pleasant.